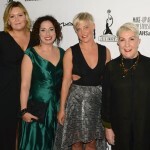 Make-up Artist and Hair Stylist Guild Awards: A Glamorous Night Hosted By Johnny Depp! Last Saturday, February 20th, a red carpet was placed outside the Paramount Theater on the historic Paramount lot for a very special occasion. This occasion was IATSE 706 Make-up Artist and Hair Stylist Awards. It is part of all things celebratory during Hollywood’s Award Season, leading up to the 88th Academy Awards this coming Sunday. The night’s awards proceedings were celebrating the best in Make-up Artistry and Hair Styling within the various camps of the entertainment industry, including commercials, television, and features. The MUAHS Awards had a special host presenter, none other than Johnny Depp, to honor Make-up Artist Ve Neill and Hair Stylist Yolanda Toussieng with a Lifetime Achievement Awards. Expectations ran high as the red carpet opened to kick things off in grand “Hollywood Style” for the big night. The hair and make-up communities know how to dress and look their best. The step and repeat bustled with great fashionable looks. So much so that the talent had some serious competition when it came to glamour. Those of note who attended the red carpet were: Dove Cameron, Tamera Mowry-Housley, President of AMPAS Cheryl Boone Isaacs, Dash Mihok, LeVar Burton, June Diane Raphael, Alyssa Sutherland, Loni Love, Lauren Lapkus, Jan Sewell, Timothy Omundson, Kate Flannery, Doug Jones, Ve Neill and Yolanda Toussieng. The red carpet had a combination of the presenters, the make-up artist and hairstylist that populated the step and repeat. There was a lot of energy present as all proceeded to the party inside the Paramount Theater. The awards program started with a welcome and introduction to the awards from Loni Love. It quickly moved to Johnny Depp taking the stage to honor his production compatriots Ve Neill and Yolanda Toussieng; both of whom have been with Johnny, since early on in his career and on innumerable projects over the years. Johnny was the personification of cool as he shared the experiences he had with each of these artists. He shared a story about working with Ve on Pirates Of The Caribbean, where he was clad in leather, rubber, and layers of clothing in the humidity of the Caribbean. Once Johnny had been made up,“Ve said, Don’t sweat!” Johnny lamented that wasn’t easy to do given his surroundings. Once the introduction was over, Ve walked up to accept her award and then both stepped aside to get photos of this memorable occasion. Yolanda received her lifetime award after Johnny told his anecdote about her use of Aqua Net on the set of Edward Scissorhands. Johnny waved his hand in a waving gesture in front of his face, as if to wave the cloud of hairspray from his face, to demonstrate the quantity of hairspray it took to maintain his hair on Edward Scissorhands. This story got a good laugh from the audience. Yolanda came up to share her thoughts; her gratitude for her career and the opportunity to work with Johnny. Then both stepped aside to get their photos together and then Johnny gracefully bowed out. The remaining presenters took turns honoring all the talented artist who have worked so hard and strived to do their best in their respective fields. 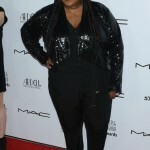 Loni Love of The Real hosted for the majority of the evening, while handing it off to other guest presenters for different award categories. 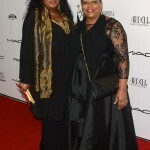 All of the presenters offered levity and insight to those they honored in the hair and make-up communities. Once the evening concluded and the awards had been awarded, everyone gathered outside the Paramount Theater on the lot to kick up their heels and celebrate their winnings in fine style with food, drink and a nifty gift bags provided by MAC Cosmetics who sponsored the awards ceremony, along with Stolen and Ardell Professional. The band played on and all mingled, to sit at tables or mosey around the fountain and grounds inhabiting the moment and letting their hair down celebrating a momentous year in hair and make-up! This entry was posted in Events, Fashion, Movies, News & Sports, Photo Essays and tagged 706, Alyssa Sutherland, Ardell Professional, beauty, Billy Bennight. Ve Neill, Cheryl Boone Isaacs, Dash Mihok, Doug Jones, Dove Cameron, Glamour, Glamourous, IATSE, IATSE 706 Make-up Artist and Hair Stylist Awards, Jan Sewell, June Diane Raphael, Kate Flannery, Lauren Lapkus, LeVar Burton, Lifetime Achievement Award, Loni Love, MAC Cosmetics, Make-up Artist and Hair Stylist Awards, MUAHSawards, Paramount Studios, Pirates Of The Caribbean, President of AMPAS, Stolen, Tamera Mowry-Housley, Timothy Omundson, Yolanda Toussieng. Bookmark the permalink. 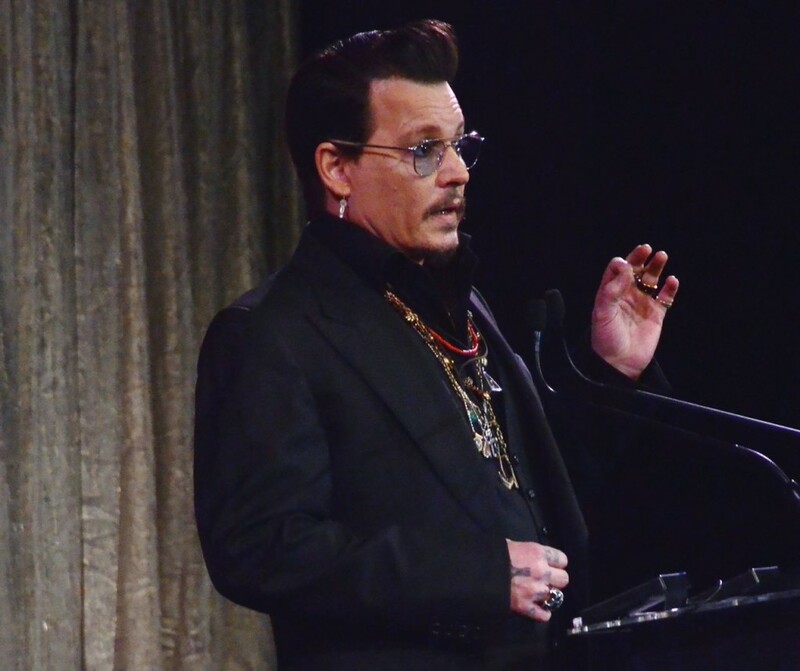 One Response to Make-up Artist and Hair Stylist Guild Awards: A Glamorous Night Hosted By Johnny Depp!